Looking over my story about Samira Soueidan, I realized I left out some vital information about why the Justice Ministry would appeal such a case. Do they not like Egyptians? Do they not like widowers? Those who’ve followed my reporting on the issue will know that the appeal is actually more or less framed around the idea of the 400,000 or so Palestinian refugees being resettled in Lebanon. Lebanon has always been paranoid that Palestinian refugees will be granted Lebanese citizenship and resettle here, upsetting the demographic balance in this hysterically confessional country. The argument put forward by officials in public is that they don’t want the Palestinians to relinquish their right to return to the country they were expelled from. (This is coincidentally one of the main reasons Lebanon also does not grant the Palestinians the right to work in most professions). But scrutinize the issue and you will find this policy is nothing but lies. Christian Palestinians were granted Lebanese citizenship a long time ago, simply because they would bolster Christian numbers. So it has nothing to do with the rights of Palestinians to return to their occupied country and everything to do with sectarianism. By granting Soueidan the right to nationality, the Justice Ministry saw a dangerous precedent being set that could pave the way for all stateless children and husbands to demand their right to citizenship. It’s especially difficult to comprehend the logic behind Lebanon’s sexist nationality laws when looking at the facts on the ground: According to a UNDP-funded study, only 2% of all Lebanese women married to non-Lebanese are married to Palestinians. This shows the law for what it is:deeply flawed and only existing to serve the patriarchal sectarian system. In all countries of the world, politicians are meant to serve their constituents. In Lebanon, politicians (except a minor handful) serve themselves and then, if they have enough energy to spare, their religious community. Samira Soueidan, a Lebanese mother of four, apparently committed a crime when she married an Egyptian man. 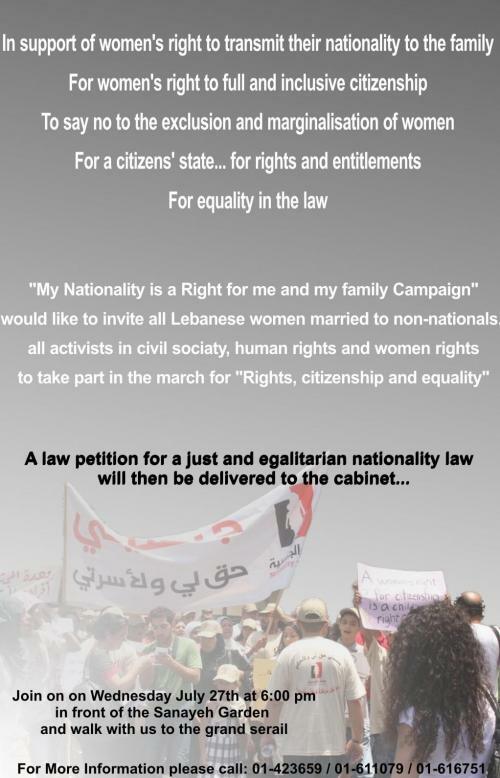 Her husband is now dead but she continues to pay for this crime- the Lebanese government does not recognize women’s right to pass on citizenship and so her children are stateless. They have never been to Egypt and do not have nor wish for Egyptian citizenship. They are Lebanese to everyone except the State. Samira wanted recognition her children are Lebanese, and so she went to the courts. The first court said yes, her children should be granted citizenship. Then the Justice Minister decided to appeal. I repeat, the Justice Minister. He wins, Samira’s children and by extension all Lebanese women lose. The irony is too much to bear. BEIRUT: A landmark ruling which granted citizenship to the children of a Lebanese mother was overturned by an appeals court Tuesday in a move that has left human rights activists reeling. Samira Soueidan filed a lawsuit five years ago demanding her four children be granted citizenship rights following the death of her Egyptian husband. Lebanese law permits men to pass on their nationality to their non-Lebanese wives and children but bars women married to non-Lebanese from doing the same. Leaving the courthouse in Jdidet al-Metn, Soueidan said she had “lost the battle but not the fight” and vowed to take her case to the Court of Cassation, Lebanon’s highest appeals court. “I’m not going to stop here,” she said, adding that her children had been born and raised in Lebanon and should be viewed as Lebanese. In a breakthrough ruling last July, Judges John al-Azzi, Rana Habka and Lamis Kazma ruled in favor of granting Soueidan’s two sons and two daughters citizenship. The judges said their decision was based on the fact there was no law prohibiting a Lebanese mother from passing on her nationality to her children after the death of her husband. They also noted that aspects of Lebanon’s nationality law were “obscure” and that current legislation favored foreign women over their Lebanese counterparts. The verdict was applauded by civil society organizations and suggested a breakthrough for thousands of other families suffering because of the sexist legislation. Ironically, however, it was appealed by Justice Minister Ibrahim Najjar. The Court of Cassation, presided over by Judge Mary al-Maouchi and two other women consultants, accepted Najjar’s appeal and overturned Azzi’s ruling, saying it contravened Articles 3 and 537 of Lebanon’s Civil Law code and the nationality law. “Judicial courts are not concerned with granting nationality rights [in cases where it was not granted at birth] as this is a right only enjoyed by the president,” stated the 17-page ruling, a copy of which was obtained by The Daily Star. Soueidan will have to pay all the legal fees incurred in the case. Representatives from the Collective for Research and Training on Development-Action [CRTD.A], a Lebanese non-governmental organization that has been supporting Soueidan in her fight, said they were disappointed but “unsurprised” by the legal setback. “The approach of the Lebanese government since Azzi’s ruling has not been encouraging,” said Roula Masri, CRTD.A gender program coordinator. She claimed the judge had been subject to harassment and “humiliation” from leading officials in the Justice Ministry. Azzi was also reportedly unofficially banned from talking to journalists, who were required to submit interview requests to the Justice Ministry. A request submitted by The Daily Star several months ago was never answered. There are around 18,000 Lebanese women married to non-Lebanese in Lebanon, according to a study by the UN Development Program. Around 80,000 children and husbands are potentially made stateless by the current legislation. Deprived of state protection and recognition, those without citizenship live in a precarious legal vacuum and cannot benefit from state education or health care, work in the formal economy or vote. They are vulnerable to arbitrary detention, have difficulty accessing the legal system and live under constant fear of deportation. A 1994 amendment of the nationality law gave the child of a Lebanese mother and foreign father the right to obtain citizenship. But in order for it to be granted, the child must marry a Lebanese citizen and live continuously in Lebanon for at least five years, including one year after marriage.